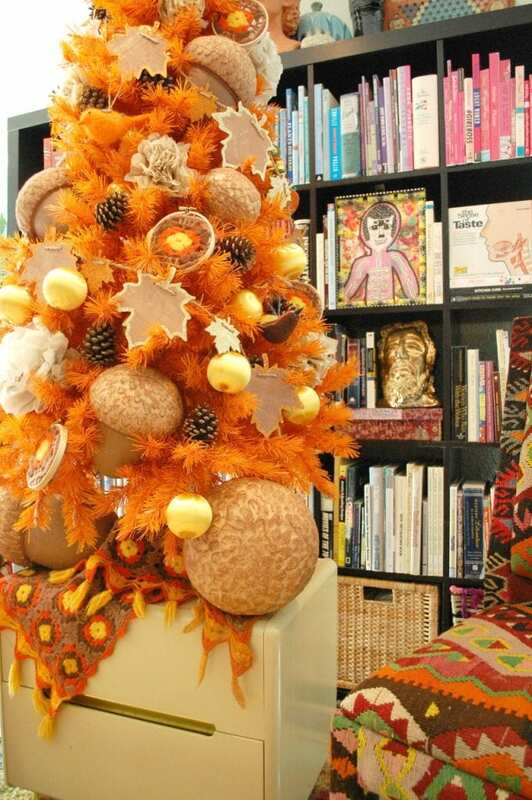 You have your autumn tree up and decorated right? 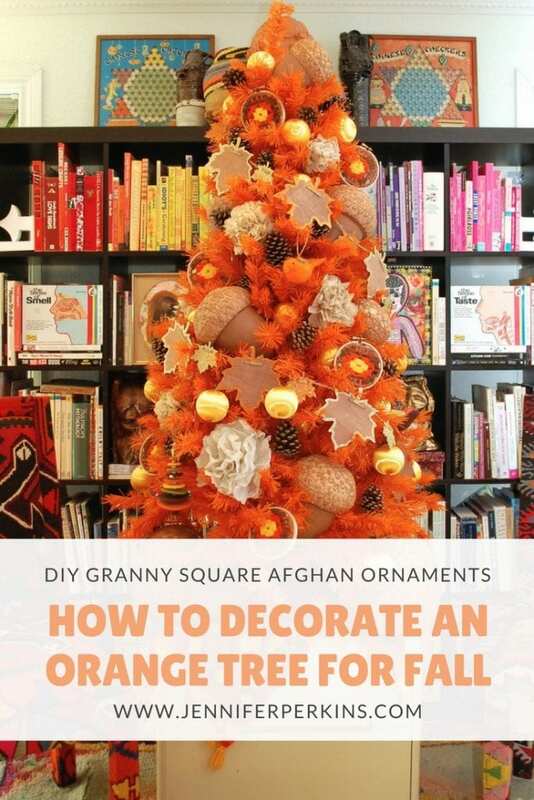 You know your orange Christmas tree covered in fall leaves, giant acorns and DIY ornaments made from vintage crocheted afghans. Ya, that one! 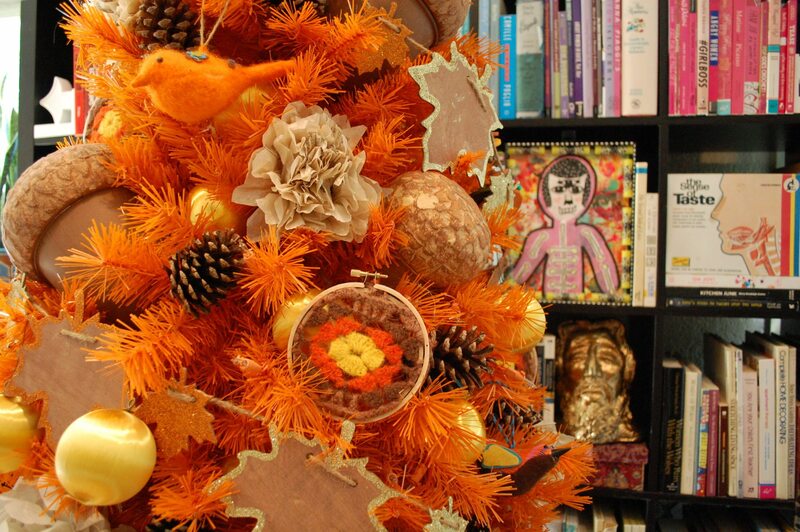 There is something about a fall themed Christmas tree in orange that just curls my toes, throw in an excuse to go thrifting for ornament supplies and forget about it. This post is sponsored by Treetopia. I am their brand ambassador which means I get free trees and I get compensated to decorate them. Can you blame me? Who says no to free colorful Christmas trees? Not this girl. 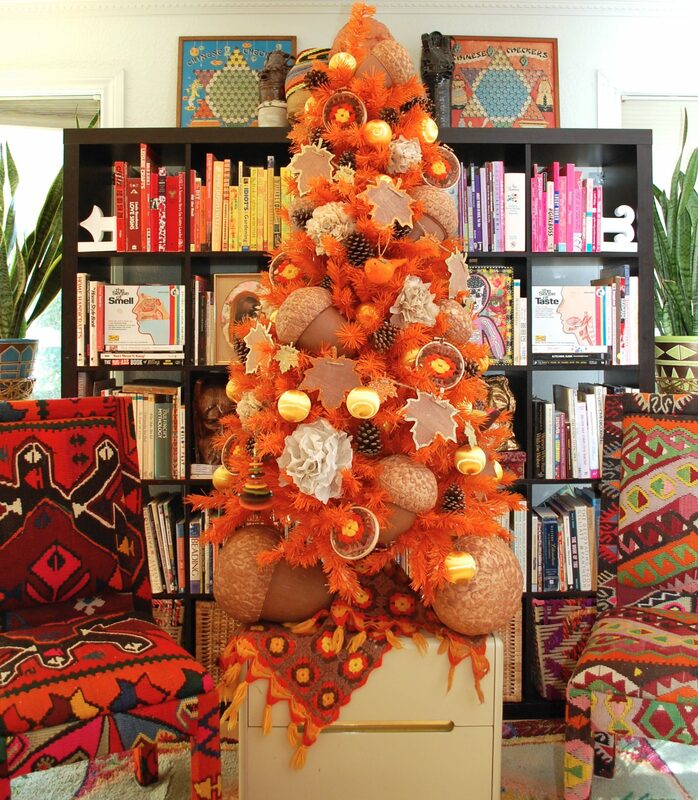 See more of this fabulous orange fall themed Christmas tree over on the Treetopia blog. Like with every tree I decorate I started with a base of ornaments. In this case the ornaments were vintage satin yellow balls. Next I added flowers made from sewing patterns (did you see these guys on my sewing themed Christmas tree?). Next came pinecones and GIANT acorns. Like these faux nuts are large and in charge. The best part, the ornaments made with vintage afghans. These DIY granny square ornaments could not be easier to make. All you do is cut up the afghan and stretch bits in small embroidery hoops. Finally a use for all those 70’s colored crocheted blankets at the thrift store. They are pretty awesome as ornaments if I do say so. I’ve decorated this orange beauty for Valentine’s Day, Super Bowl, Halloween and Christmas, but this festive fall version might be my favorite. Which one is your favorite? Want more fall decorating ideas? Keep reading! Recycled Afghan Wreath for Fall – More uses for those groovy 70’s crocheted blankets at the thrift store. Stretch them in embroidery hoops and make them into a wreath. 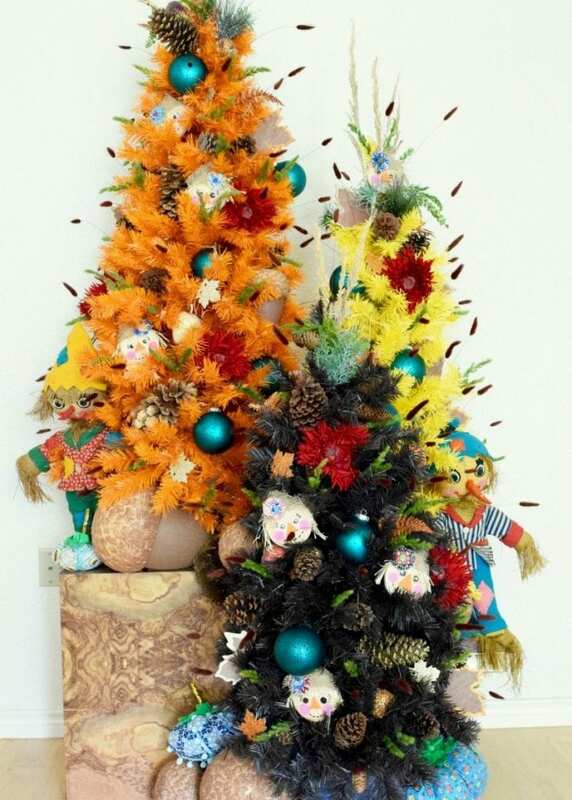 DIY Scarecrow Ornaments for an Autumn Themed Tree – Did you really think that I had only decorated one orange fall tree in my time? 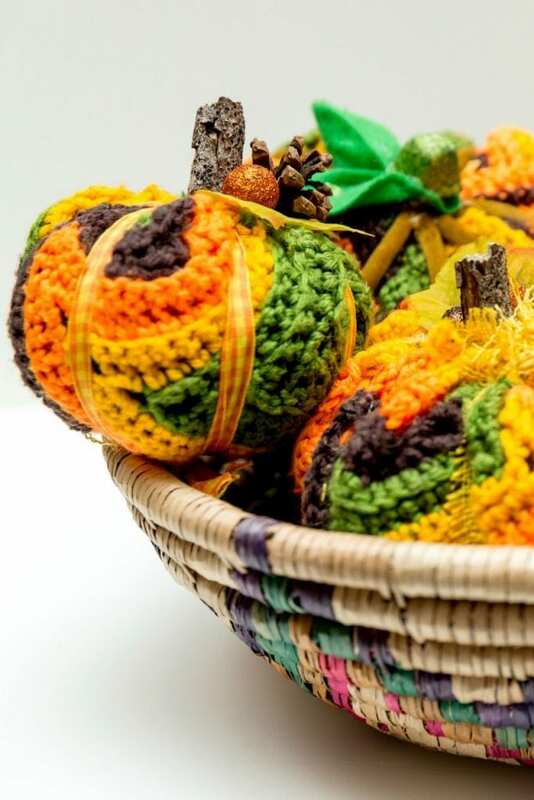 Up-Cycled Crochet Afghan Pumpkins – Did you catch the episode of DIY This With Jennifer Perkins where I made pumpkins from granny square blankets I picked up at the thrift store? 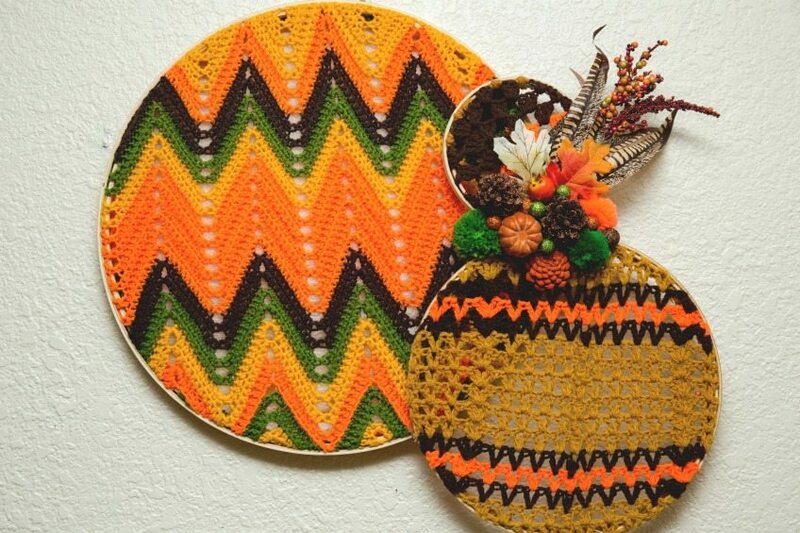 Posted November 19, 2015 & filed under Crafts, Holidays, Recycled Crafts, Thanksgiving. Did you recover those chairs too? I’ve been meaning to recover my couch, just don’t know where to get started.